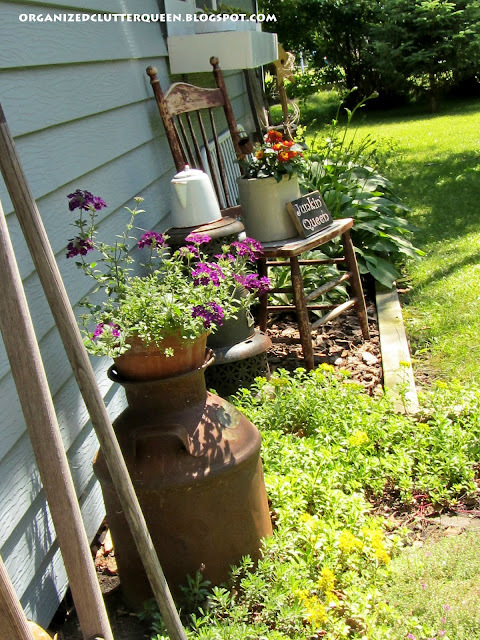 Two rusty cream cans, three vintage farm tools, an old heating stove, a distressed chair, a cracked old crock, a buggy wheel, Dutch wooden shoes, an enamelware coffeepot, and a futon back painted white, are all leaning against this outside wall of my house, or in and among the plants. Here's a tool of some kind to loosen the dirt, a seeder given to me by a neighbor and a pitchfork. A very, very rusty old cream can once owned by a farmer from Bagley, Minnesota, (according to the tag) with purple trailing verbena and white alyssum. 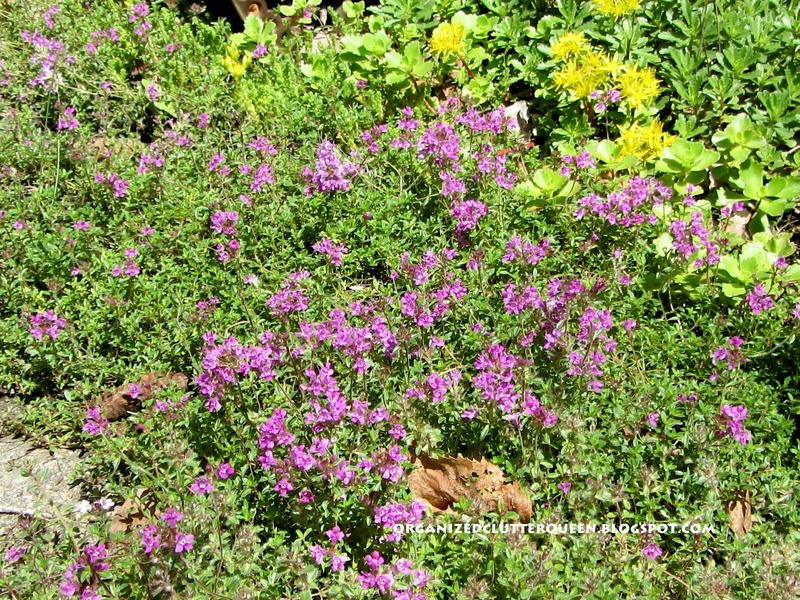 Now in bloom and a little behind the woolly thyme is the creeping thyme and two varieties of creeping, yellow blossomed sedums. This is an old Perfection stove. It has been in my gardens for years and has one leg almost rusted off. It's a red Lantana and a sign I purchased at the Tattered Angel, locally. I actually should be the "Junkin' Princess", as my Mom would qualify as the "Junkin' Queen". She has been at it a lot longer than me. The buggy wheel, futon back, Dutch shoes and a star birdhouse are at the far end. That end was just covered in Outdoor This and That 3 post recently. I still have a few cutworm caterpillars around, and I just discovered slugs in the hostas, but I guess gardening is getting a little better! 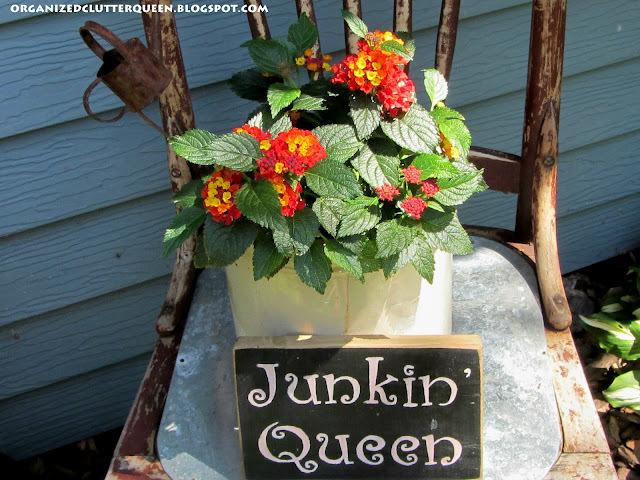 You are a good junking queen. You need to show us pictures of your mother's. I love all of this. Some people would probably think we were crazy, hah. Hi Carlene! Oh, if this is junking - I love it! What a cute spot! 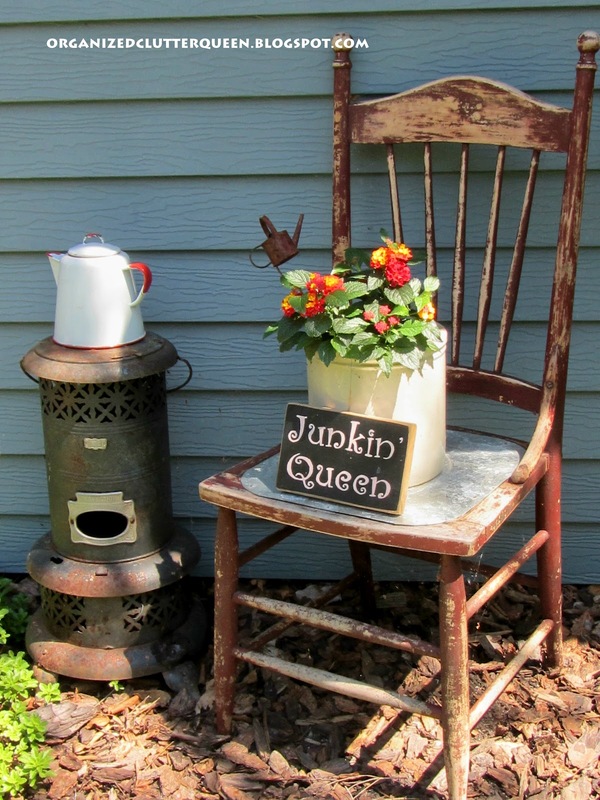 I just love your junkin style!! So cute and full of whimsy! Thanks so much for the inspiration!! That is just seriously awesome! You sure have an eye for putting it all together! I love that seeder! It's good to have neighbors who have "junk" we want. 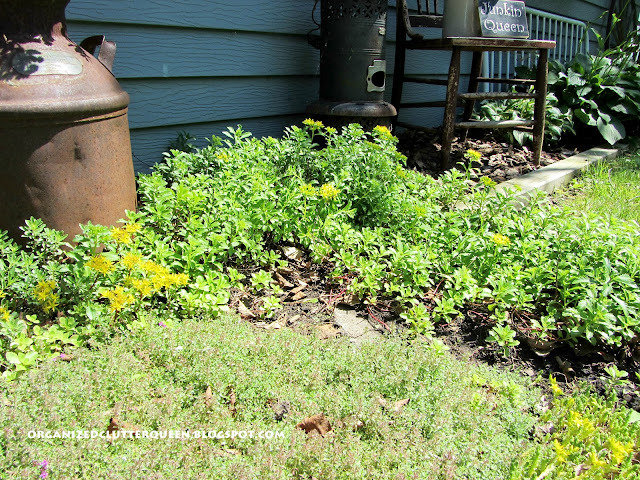 I actually have Black Eyed Susans and purple cone flowers blooming...in mid June!! Unheard of. This is a very strange year, that's for sure! wow wee...my kind of flower bed decor! I do love the old junk and I do love old tools! 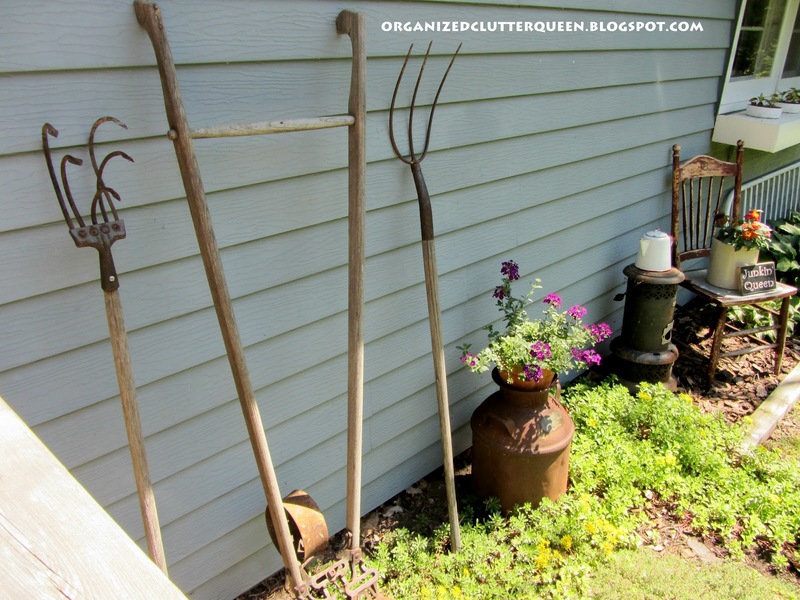 Your "outdoors Junk" looks great. You have a very nice bunch of garden art there. Nicely done. 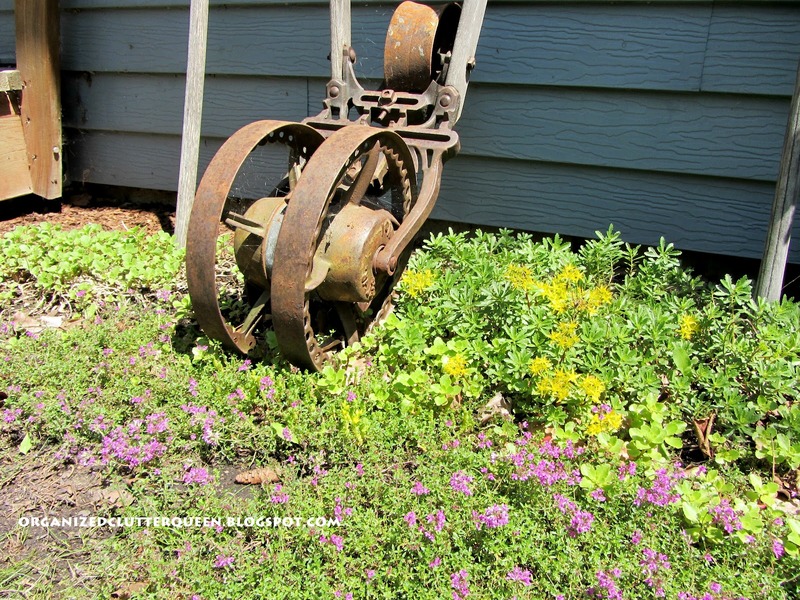 I adore your junk garden and would love to see pictures of your mom's junk, too! I love it all! It gives me inspiration and junk ideas to look for! enJOYed this post very much. You have such a good eye for putting these pieces together. 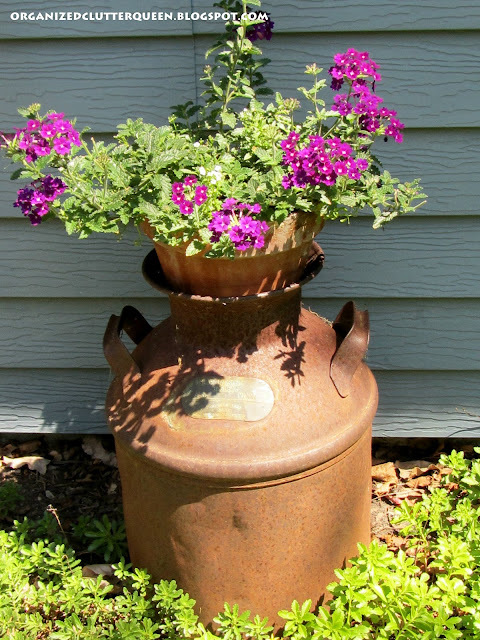 Love your flowers in the old cream can. 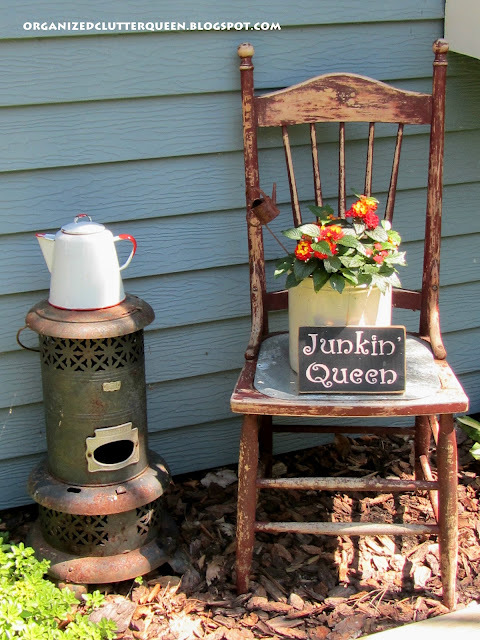 Came over from Cowgirl Up to see your junkin' garden. Wish you lived next door so we could mix your treasures with mine! The only thing I saw missing was crib springs - keep them in mind - they make great trellises! Your junkin'garden is so sweet and your plants are gorgeous! Thanks so much for linking up to Share the Love Wednesday! So charming--I love it all! That is the cutest and nicest landscaping I have seen! You are SUPER inspiring and that is just how I want to landscape but you know just how to put things together to show them to their best advantage and I'm not sure I do!LOL! I have one of those little stoves painted white and I have a blue and white speckled coffee pot and and old chair and crock....hmmmm....I might just be able to do that although of course I would be totally copying you! LOL! I never have any original ideas and if I do no one wants to copy mine! LOL! 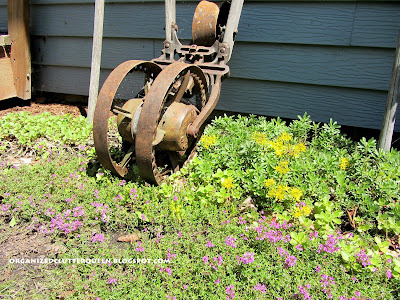 I love to see these old items in a garden - gives the yard great character! 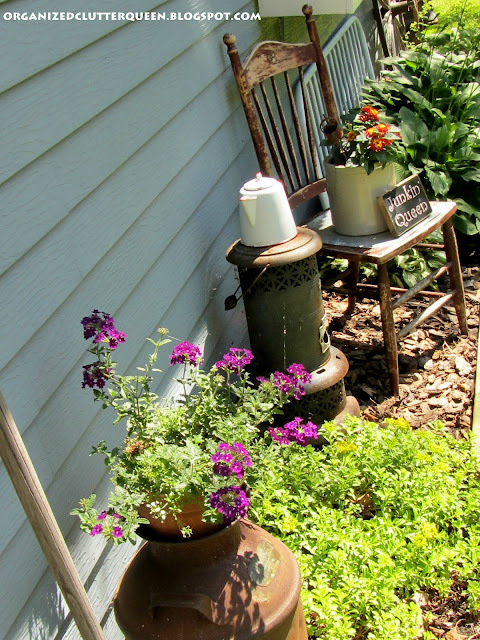 Carlene, you have THE best junk and you know how to make it shine in the garden. I'm loving each and every item and how it's displayed. Thanks so much for always coming by and leaving me your sweet thoughts at Quirky Vistas. It makes my day! Lovin' the Junque, Carlene! It does take time and patience, but we can only take a page out of our vintage collections book - they give us a good example. They didn't get to look that way overnight, and neither will our gardens!